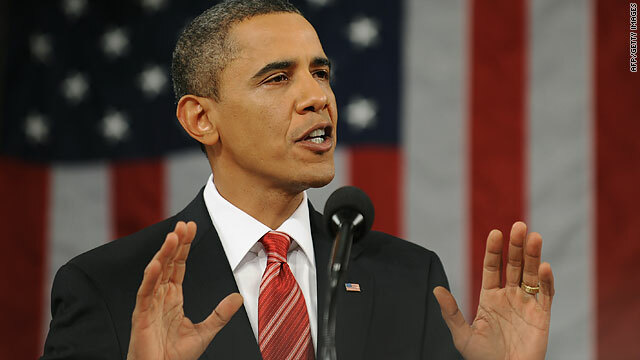 One analyst says Obama's State of the Union speech was positive and optimistic, with a serious overtone. (CNN) -- When it comes to word choice, President Obama is less positive than any president in modern time, according to a scholar who has dissected the language of State of the Union speeches since Harry Truman's 1946 address. James Pennebaker, professor and chairman of the psychology department at the University of Texas-Austin, theorizes that the language that presidents use in these high-profile speeches reflects their overall mood and state of mind. The president isn't negative per se, Pennebaker said, but he doesn't use as many words such as "happy," "excited," "enjoyed," "good" and "nice" that have positive tones, making his tone more somber. Deborah Tannen, linguistics professor at Georgetown University, disagreed somewhat. She said she thought the tone was positive and optimistic, with a serious overtone. "I felt like it was serious, because he realized that people are worried and that it's a serious time. We are facing serious problems," she said. But a person who inspires optimism and hope in others doesn't necessarily exude positive emotions, Pennebaker said. Instead, Obama has shown himself to be "cool in every sense of the word," Pennebaker said. "He is a guy that many of us really admire. He's the cool guy at the high school dance. He's not giggly and funny. He's cool. And a cool person can really symbolize optimism for the future, and this person can be a good and strong leader, but they don't have to be the class clown. They don't have to be laughing and saying they're happy or that things will be great," he said. Obama's speeches also indicate that he is the most complex thinker of the presidents Pennebaker has studied, with John F. Kennedy as the runner-up, he said. That's because Obama frequently presents an idea and re-evaluates it from a variety of perspectives in subsequent sentences. Obama is also a more dynamic thinker than he is categorical, Pennebaker said. He does not tend to break things down into components, as other politicians such as George W. Bush have done, but looks at the history of the topics he speaks about. For example, at the very beginning of his speech Wednesday night, Obama said that while it is tempting to assume America was always destined to succeed, the country's history shows otherwise. "But when the Union was turned back at Bull Run and the Allies first landed at Omaha Beach, victory was very much in doubt. When the market crashed on Black Tuesday and civil rights marchers were beaten on Bloody Sunday, the future was anything but certain," he said. Generally, the way he spoke this year was similar to the way he spoke at his inaugural address last year and even during the campaign, Pennebaker said. "You don't see any giant jumps in terms of the way he's thinking, feeling, relating to others," he said. Presidents tend to be consistent in their speaking regardless of what is going on in the country, Pennebaker said. After the September 11 attacks, President George W. Bush continued to use positive-emotion words at relatively high rates. Pennebaker's team also analyzed blog posts from that year and found that people's emotions reflected on the blogs were back to their pre-9/11 state within four days. "If there's something bad that happens, you bubble back up to your emotional state surprisingly quickly," he said. Obama's word choice also reveals that he is a bit more psychologically and emotionally detached than some other presidents, perhaps on par with Ronald Reagan, he said. It's not necessarily that he's hiding his feelings, but he does not present himself as an emotional person. "If you sit down and talk with him, you're not going to get a sense of what his deep emotional feelings are," Pennebaker said. "Whereas if you sat down with Bush and Clinton, they would give you signals of how they felt." The subtleties that Pennebaker studies are nearly impossible to hear just by listening to a speech, he said. He uses a computer algorithm to calculate the percentage of total words in a speech that reflect a variety of categories, such as "positive emotionality" and "dynamic thinking." One parameter is the number of function words -- pronouns, prepositions and articles -- a person uses, which can say a lot about his or her mindset, Pennebaker said. For instance, someone who thinks a lot about people and is social would use a lot of pronouns. Someone who wants to avoid the press tends to use "I" a lot, he said. Although presidents generally don't write their own speeches, they do approve them, and speechwriters must know them very well, Tannen said. "It's as much his own words as any speech is going to be these days," she said.